Covering every month of every theatre of World War II, this huge atlas is for wargamers and anyone interested in World War II. It provides a highly interactive and thought-provoking view of the war, and is a great starting point for �what-if� scenarios. 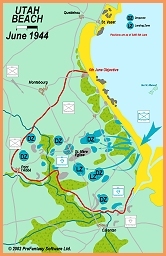 Each map contains date, movement, unit strengths and other military details. From the world overview you can cycle through each month of the conflict, watching the changing events unfold. Click on important areas to bring up more detailed maps of the conflict. For example, punch down through the European maps to see Omaha Beach, the Battle for Stalingrad and the Raid on St Nazaire. The Atlas works stand-alone, using its own powerful viewer. You can quickly search for events, zoom to any map area and control exactly what map features and troop details are displayed. The maps are all in vector format, so you'll see no loss of detail as you zoom in. You can print any map view at any scale, even tiling across sheets to suit any size of table-top game. If you have CC2-Pro, the Atlas will enhance it with flags and unit counters for the participating nations, NATO military symbols and tools to add troop movements, map features and customized units. With CC2 you can edit any Atlas map to suit your own needs.